Whatever you are planning to do – we are the right hotel for you. 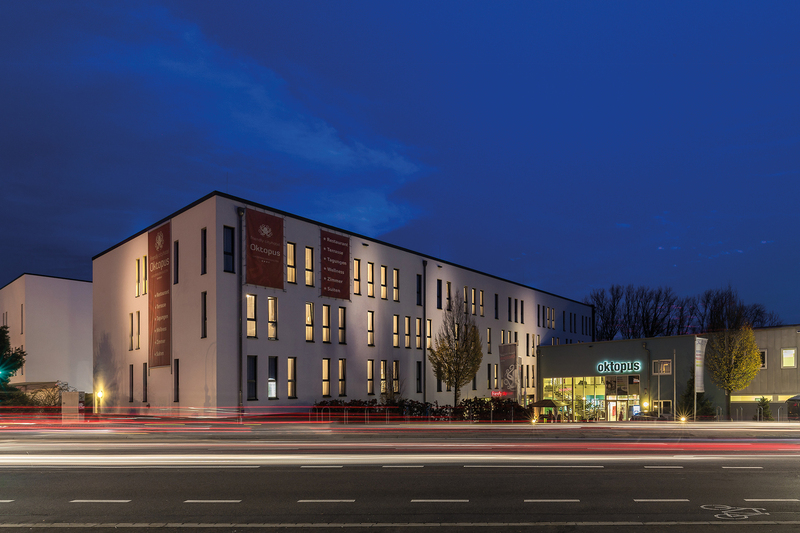 Located near the city center of Siegburg, we offer a relaxing environment, in the heart of the metropolitan area of Köln-Bonn. Through to the excellent transport links, every destination near Cologne or Bonn is just a few minutes away. For all your activities, we offer the right base. With our specials & top conditions for business traveler, diver, globetrotter, couples, friends and families we create more experiences and more money in your wallet. Summer – a beautiful season. Have a summer stay in our Friendly Cityhotel Oktopus! 65 feet deep, 32 to 60 feet wide, 3 million litres of water – you will not find such an indoor-diving facility anywhere else in Europe. The "Natursteig Sieg" offers almost 100 km hiking way. The first rays of sunlight touch the skin, nature awakes to new life and everything is green & blooming. For old & young rabbits, love bunnies & whole rabbit families. Book 3 nights in combination with our „May Special 3 to 2” and pay just 2 nights. Immerse yourself in the colourful underwater wolrd of SEA LIFE Königswinter and pass through Germany’s unique 360° tunnel made of glass. 2 nights in our double room standard. Visit the medieval Christmas market in Siegburg and let yourself be revert back to a long forgotten time. Treat yourself a break at the end of an eventful year in 2018 and forget the hustle and bustle without New Year's Eve excitement at the Friendly Cityhotel Oktopus. Our "3 star superior" hotel offers 86 rooms. We offer comfortable single and double rooms as well as family rooms and suites. Also a handicapped fair room complements our offer. Of course, all rooms have Full HD satelite television, a personal safe and hair dryer. Of course ... but worth mentioning is the protected VDSL WIFI and this is available inside whole hotel free of charge. Our “French” rooms offer all our services at the most competitive price. Here you will find everything you need for a comfortable stay. A little bit more of everything: Our „Standard“ rooms offer enough space and comfort for a longer stay. Whether in single or double room – you will enjoy it. The „Comfort“ room is the best choice for those guests who want to allow themselves something special for their stay. A comfortable place to sit and read, enough room for a little meeting and amenities of the highest quality invite you to stay for as long as you like. Our suites meet the highest requirements. Our most spacious and finest accommodations are the ideal place to work and relax. The extensive furniture and the quiet atmosphere will make sure your stay will be unforgettable. There are many good reasons to visit our region. The Friendly Cityhotel Oktopus offers you the opportunity to do it with the highest comfort. For us, making our guests happy is the primary focus. Kindness, comfort and excellent service are the keywords of our business. That is one reason why we offer the ideal background for your conferences and meetings. We make sure that you have the time for what is really important: The success of your enterprise. We create the right atmosphere for effective work, but also for necessary relaxing. All of our three air-conditioned conference-rooms are there for you around the clock, just as our staff. Locally we offer maximum comfort. Other hotels have indoor pools: We have the water theme parks. We also have the largest diving tower in Europe in which you can explore a sunken city! In the summer months, you can enjoy a relaxing bathing fun in our outdoor pool. 90% of children and adolescents are enthusiastic users. 20 meters deep, 18 or 10 meters in diameter and over three million liters of crystalline water. Gönnen Sie sich eine "Auszeit" für Ihre Gesundheit!